Without a doubt it takes determination, focus and patience to achieve your fat loss goals and fitness goals. Those that are serious about both body weight management and health improvement know that diet and exercise go hand in hand. Getting help along the way is an added bonus that also helps us to stick to our plans and work through those tough moments when we’re feeling “out of sorts” and fall off our diet plan or just can’t get motivated to exercise. Losing muscle mass as we age does not have to be part of the aging process, it is preventable…but only if you take the proper action steps to do so. Sitting around thinking about it, reading about it, talking about it or wishing it to be won’t get the job done. If we hope to maintain or even reverse the aging process then paying attention to the amount of body fat and the amount of lean muscle tissue we have is mandatory. Here’s a list of helpful tips and techniques that will help you burn body fat and build lean muscle tissue. 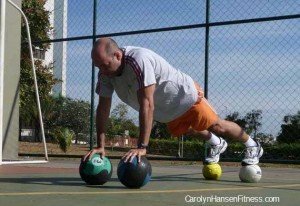 Focus on Body-Weight Exercises: It’s unfortunate, but many people get into the bad habit of completely ignoring bodyweight exercises for one reason or another. Although weight training using free weights is generally superior in terms of improving strength level and boosting metabolic rate, you can also do very challenging exercises to get the job done as well. Consider for example doing a set of pull-ups, possibly using a weighted vest if you need additional challenge. This body weight exercise utilizes all the main muscle groups in the upper body, giving you a very complete workout in a short period of time. Body weight exercises can be done on their own as a full body weight workout session or can be easily added to other strength based moves that you are doing as well. Slow Down Your Movement Pattern: Doing reps too quickly is a mistake made by many people. If you rush through the reps that you do, there is a good chance that you’ll be at least in some part using momentum to help carry you through the exercise pattern…and that momentum is robbing the needed stress from your muscles. Slow down…not super slow but take at least 2-3 seconds to lift the weight up and another 2 seconds or so to lower it back down. This places a constant level of stress and tension on the muscle tissues at all times which in turn increases your total strength level. Make sure to focus on each contraction as it takes place. Thinking about and focusing on each contraction as it takes places allows you to emit more total force and make sure that you see the strength gains that you are after. Squeeze Your Abs During Every Exercise: Focusing on and squeezing your abs during exercise helps you not only prevent lower back pain that develops when you back starts to sway…but the ongoing tension being held in the core will strengthen those muscles as well, taking your core development to a new level. This constant tension is also going to help boost your posture as well so that’s another benefit you’ll receive. Use Pre-Fatigue Sets: If you’re currently stuck at a certain weight level and can’t seem to increase it to see better progress and gains, it’s time to us a pre-fatigue set to get yourself moving along. A pre-fatigue set is where you perform one isolation exercise to tire out one of the helper muscles that will be used as you perform your main life. If you are doing a bench press, you might do a triceps’ extension first and then move on and do the bench press activity. In doing so, you put more emphasis on the chest muscles which results in greater strength gains for those muscle tissues. Pre-fatigue sets are very intense so you don’t want to do the on every single workout you do, but on a few workouts added in on occasion when you need an extra boost. Try Kettlebell Training: Kettlebells are expecting a new wave of popularity because it uses almost all the main muscles in the body and provides a very well-rounded workout in a short amount of time. Your metabolism receives a boost for hours after your session so it’s a great way to crank up the heat in your fat burning protocol. You can use Kettlebell training as your primary means of training or you can do a combination of Kettlebell as well as dumbbell training. If you are not exercising you will store food as excess body fat rather than building it up as lean muscle mass. It’s time to begin focusing on both diet and exercise and getting both of these into your health and fitness program. If you use some of the smart exercise techniques listed above you won’t have to spend hours at the gym each week. It’s not about how much time you spend in the gym…it’s about the quality of what you do there that matters.